As part of a Problem Solving Course that I teach, I have several sessions on probability theory. Given that attorneys must frequently make decisions in environments of uncertainty, probability can be a useful skill for law students to learn. Conditional probability, and Bayes’ Theorem, are important sub-topics that I focus upon. 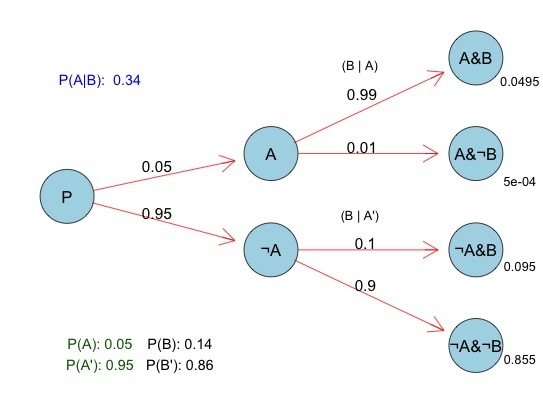 In teaching my students about Conditional Probability, it is often helpful to create a Conditional Probability Tree diagram like the one pictured below (sometimes called a probability tree). I’ll explain in a future post why such a diagram/graph is a useful visualization for learners. No Probability Tree Diagrams in R ? Like many others, I use the popular free, and open-source R statistical programming language. R is one of the top computing platforms in which to perform machine learning and other statistical tasks (along with Python – another favorite of mine). To program in R, I use the excellent R-Studio application which makes the experience much better. 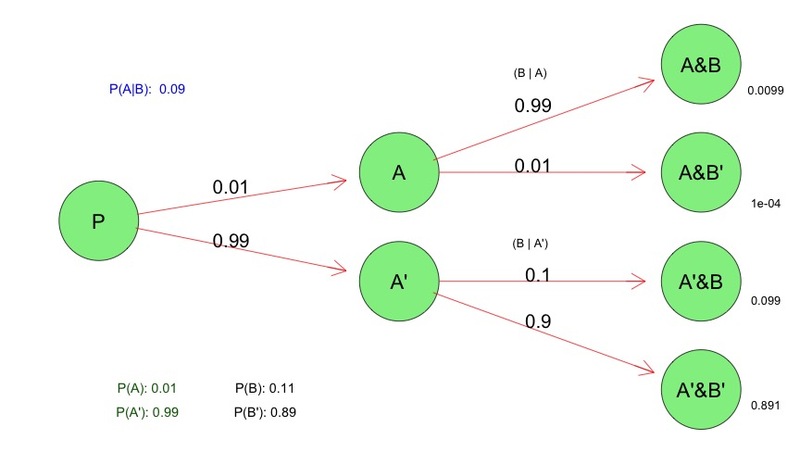 Given the relationship between R and statistics, I was somewhat surprised that I was unable to find any easily accessible R code or functions to create visually appealing Conditional Probability Tree diagrams like the one above. Thus, I put together some basic R code below for visualizing conditional probability trees, using the Rgraphviz R package. You must install the Rgraphviz package before using the R code below. If you know of other ways to create visually appealing conditional probability tree in R that I may have missed in my search, please let me know. I thought I’d release the code below to others in case it is useful. (Caveat: This is rough code, and has not been thoroughly tested, and is just meant as a starting example to help make your own probability tree diagrams – so no guarantees). Posted in Statistics and Probability on March 2, 2015 by Harry Surden.